Santa may be getting these for Christmas this year. The bonus...you don't have to frost them! You can use your own sugar cookie recipe, or the one I've provided. It's so fast & easy, you don't even need to refrigerate the dough! 1. Preheat oven to 350 F. Cream butter & sugar together until light & fluffy. Add eggs & vanilla and mix well. 2. Add baking powder, salt & flour. 3. 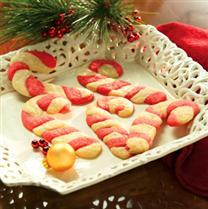 Divide dough in half & color one half red using 1/2 t. red food coloring. You can also add 1/4 t. peppermint extract if desired. 4. Roll 1 spoonful of plain dough into a 6-inch rope on a lightly floured surface. Repeat, using 1 spoonful red dough. Place ropes side by side; twist together gently. Pinch ends to seal. Curve one end into the "hook" of a candy cane. 5. Transfer onto a baking sheet & cook for 10-12 minutes.